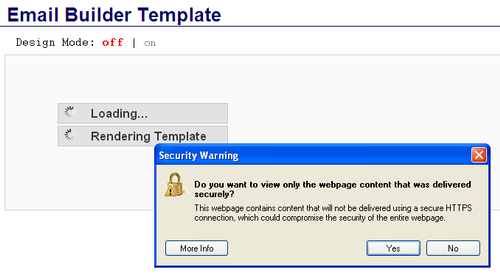 Internet Explorer 8 Users "Just say No"
When using your Admail Email Builder Templates with Images - IE 8's default security setting will ask you "Do you want to view only the webpage content that was delivered securely" and the answer is "No". If you say yes the unsecured Images in your Template (photos, logos, etc) will not load and you will find yourself stuck! See sample screen shot below.